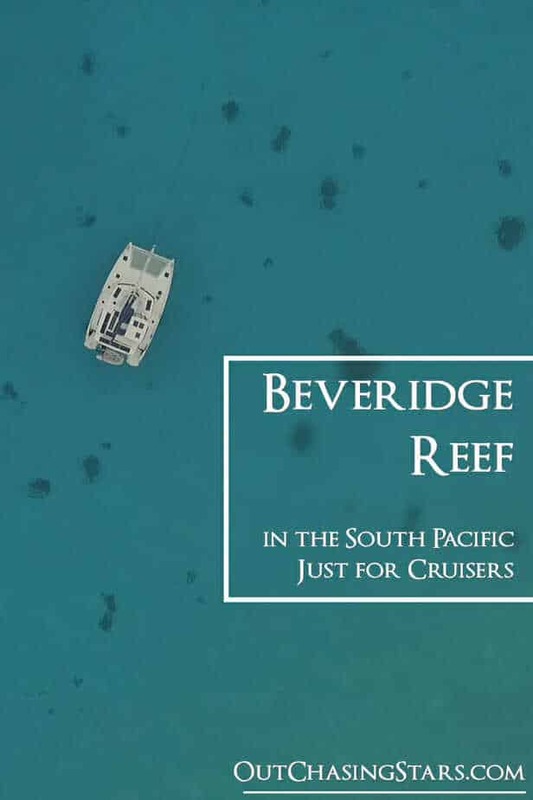 Beveridge Reef was an interesting place for us to visit, and one that we’d been excited about for a while. With every place, you have to take the good and the bad. 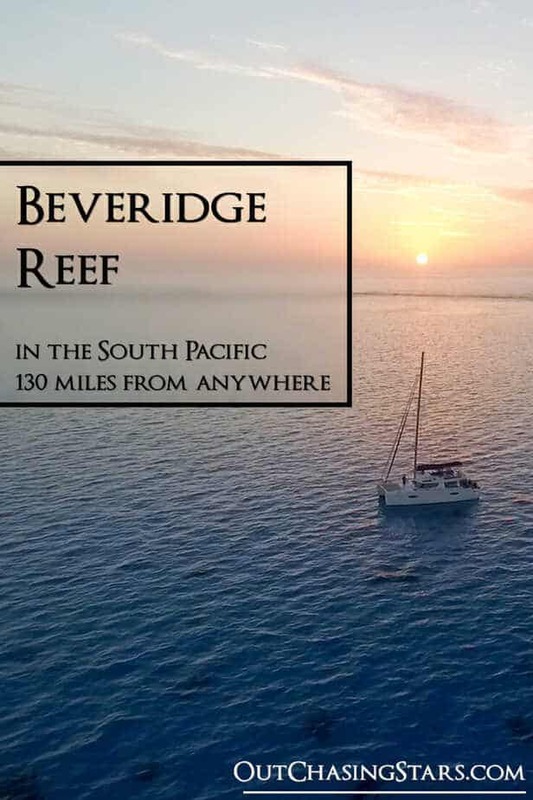 Beveridge Reef is a submerged atoll 130 miles east of Niue and 600 miles west of the Cook Islands. There’s no land, no houses, no people. Just the wildlife, and a few intrepid yachties who make it out here. Thursday the two boats that were here left, so we had all of Beveridge Reef to ourselves. Unfortunately, the wind and swell picked up. The hazard of a place like this is that with no land, comes no protection from the swell and winds. This is not a calm anchorage. We are glad to be in a cat! That being said, it is an absolutely beautiful location. We spent the day doing some chores and cleaning. I baked bread and banana muffins while running several loads of laundry. Friday morning our escape hatch was leaking. I only found this out when I noticed that the clothes in the laundry pile (under the machine) were soaking wet and some were even moldy. So that means I spent the morning doing more laundry! We also had a new boat come in, a monohull named Viking. We hailed them, a bit worried about their path into the atoll. They were worried about us, since on the chart it looks like we are on shore. Again – horribly inaccurate charts. Both parties assured each other we were ok. We gave them some tips for the pass and they anchored near us. That afternoon David and I wanted to go for a snorkel. 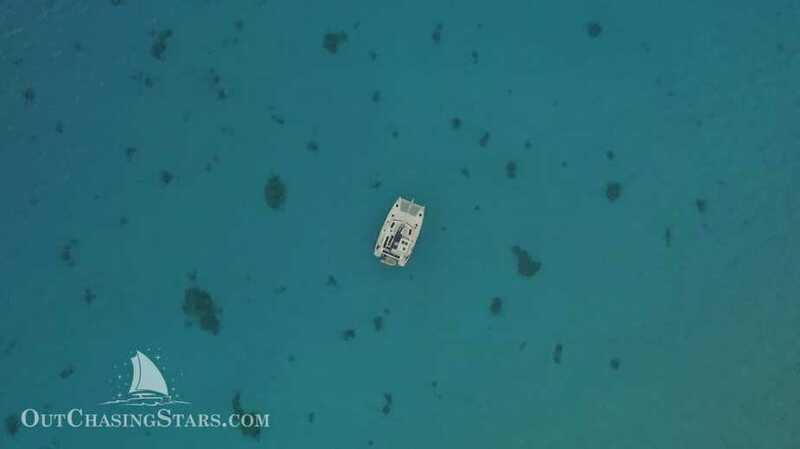 We’d heard about a wreck located near us, identifiable by being one of the only things sticking out of the water. We hopped in LD, rocking and rolling in the waves, and made our way over. 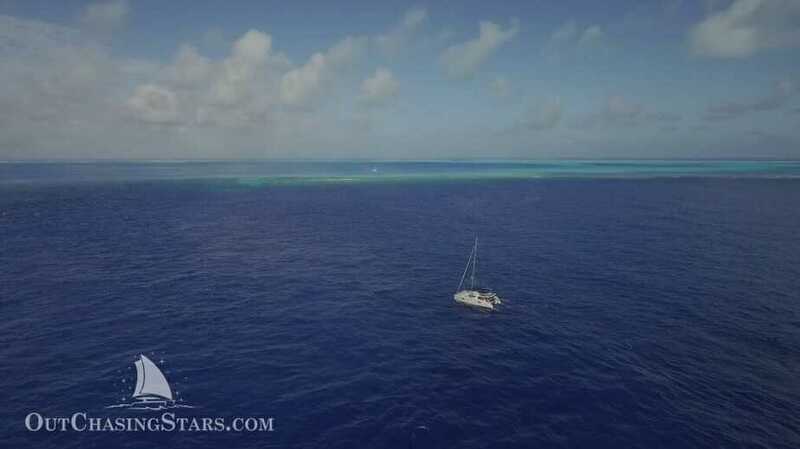 We anchored and hopped in, finding some large reef fish and very unusual rock formations – we honestly aren’t sure if it was a wreck or just rocks. However, about two minutes into our swim David yells and starts flailing in the water. I’m concerned and going to try to calm him down when I notice a flash of bright blue in the water – jellyfish. And then the jellyfish stung me. More flailing and then rushing back to the dinghy, and back to SH. The jellyfish did sting David, a small bump behind his ear. It’s amazing that the jellyfish didn’t sting his face. The jellyfish stung me in about two dozen places all over my right arm and back. The biggest concern was that we didn’t see exactly what stung us, and the tropical Pacific is the home of box jellies, which can be deadly. If you get stung by one there’s not really much you can do about it in a remote situation like this. Box jellyfish don’t have a 100% kill rate– we know several people who have gotten stung and survived. Back on SH the first thing we did was pour some white vinegar on the stings. White vinegar doesn’t help in all jellyfish stings, but it won’t hurt. Next, I did a hot shower off the back of the boat, and that’s what helped the most. I also popped some acetaminophen. 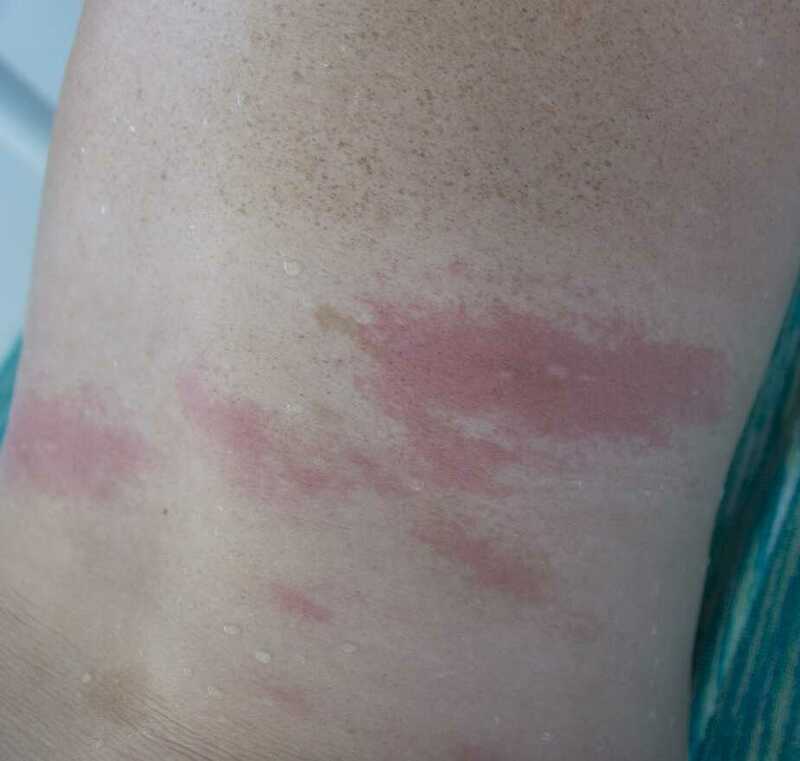 At first, the stings were white raised bumps that stung, and then turned into a large red rash that burned, and then that faded to small white bumps that look like bug bites. All this occurred in about an hour’s time. We suspect that we were stung by a Portuguese man-o-war. Between the sharks, the jellies, and the motion of the ocean, this may not be my favorite place ever. However, leave it to other cruisers to turn the day around. Vaughn, Scott, and Christina from Viking came over to say hello. After a bit of socializing, they left to go swim outside the reef. On their way back, they brought us a gift of a coral trout! Scott filleted the fish for me. 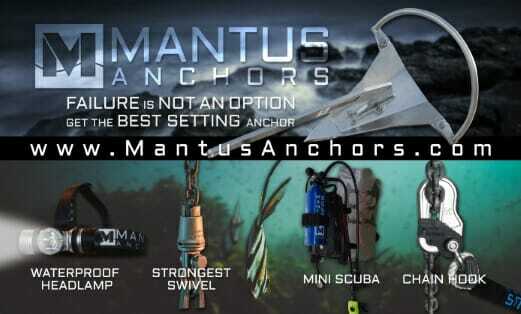 We gave them a few beers and chatted for a bit more about our boat and underwater photography. They showed us the pictures they took with their DSLR and underwater housing of swimming with the whales – amazing! Fresh caught fish for dinner – not too rough! I made beer battered fish with half of the fish and froze the other half. And DAMN it was really good fish. The next day I had some muscle soreness in my back and glutes – from the stings or the flailing, I’m not sure. 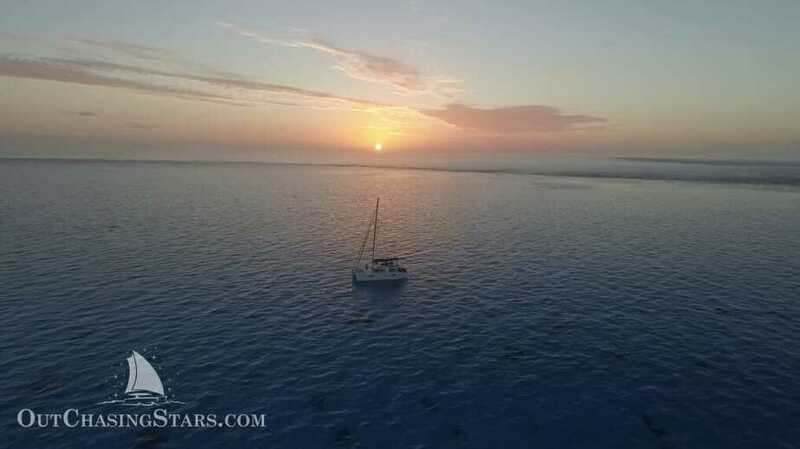 Viking left, giving us two nights alone in Beveridge Reef. 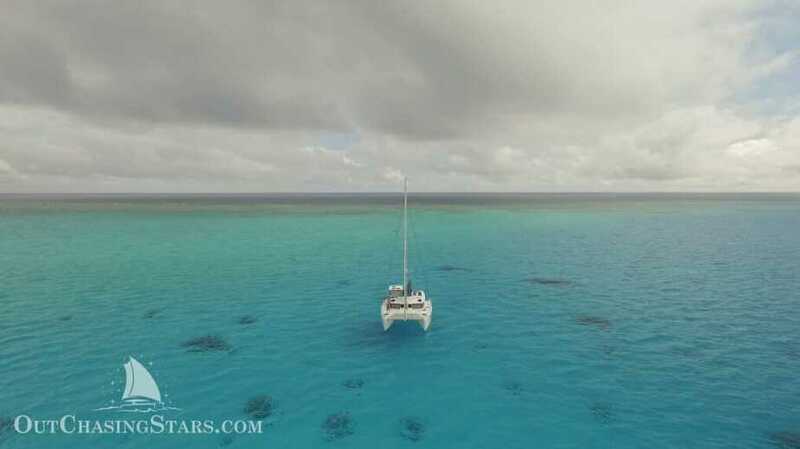 We didn’t want to arrive in Niue on the weekend and we wanted to be able to sail the whole way as we are running low on diesel. That meant we kept delaying our departure, but we finally sucked it up and left this morning at 11 am. Exiting was easy. We followed our trail out and only encountered 1 knot of current flowing with us. There were no whales outside the pass, unfortunately. We should arrive in Niue by sundown on Tuesday (tomorrow). Sorry about your stings….hopefully you will recover quickly. Thank goodness it wasn’t worse for you. Praying for safe travels in living your dream. Thanks Lisa! I was impressed that the stings stopped hurting about an hour later. I still have some spots but it doesn’t hurt! Sorry to hear about the stings, I was stung once (maybe 50 years ago) and the fact that I still remember the experience is testimony to its significance. Take care of yourselves. Thanks Jan. Feeling much better now! I’m glad you guys are ok. Be safe.